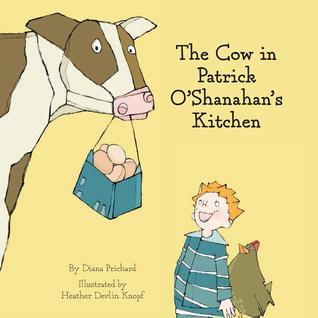 It’s a happy coincidence that “The Cow in Patrick O’Shanahan’s Kitchen” crossed my desk today. My friend Kelcie and I had just finished making plans to meet for our weekly burger night. Perhaps morbidly, we always refer to this event as “eating cow.” Kelcie always makes sure to get her “cow” with “added strips of pig,” meaning (of course) bacon. Okay, that really is pretty morbid, but that’s all Kelcie’s fault. I only go along with it so she doesn’t feel bad. Okay. Not true. It’s just how we jokingly refer to getting burgers, because we understand our burgers’ provenance. Patrick O’Shanahan has never really thought about where his food comes from, until one morning when he goes into the kitchen to help his dad make World Famous French Toast for breakfast. There’s a cow in the kitchen. A real live cow staring back at him. When Patrick’s dad asks for three eggs, you can imagine what Patrick finds in the refrigerator, and who knew that maple syrup actually comes from trees? Breakfast that morning taught Patrick a few lessons about where food comes from, and your child will enjoy learning right along with him. Heather Devlin Knopf’s illustrations are funny as well. My favorite is of Patrick and his cat—both with mouths agape—staring at the cow, who stares back quite unimpressed. This entry was posted in Books, Children, General Fiction, Humorous. Bookmark the permalink.